Bake a round cake the size that you need. Here are some great cake recipes. Using star tip, size #18, ice the eyes in black icing or dark chocolate icing. 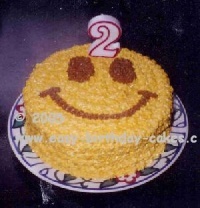 Next, put the smile on the cake using the same tip and icing as the eyes. Finally, fill in the smiley face with yellow icing and star tip, size #18. This is a very easy cake to decorate. It is definitely one of the easiest. This is a great cake to try if you are just getting started with decorating cakes or if you are very short on time. It is better than a plain iced cake and kids will love it! Another great idea for this cake is to bake a small round cake and use it as the dig in cake for a child's first birthday! Just make sure you take lots of pictures, you are going to want to remember the birthday child digging in!